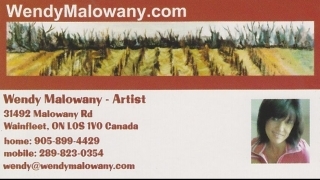 Wendy is now teaching Art Workshops for children and adults in her newly renovated studio here on Malowany Farm in Wainfleet, Ontario. We’re 10 min. from Port Colborne and Welland, and 30 minutes from St. Catharines and Niagara Falls. Wendy Malowany earned her A.S. In Fine Art, her B.F.A., majoring in Painting, and her M.S. in Art Education. She has been drawing and creating since her childhood in the U.S. and Scotland, creating art at a professional level for over 20 years, and teaching art to children and adults for over 15 years. Although she majored in painting, she enjoys working in many media, which is a great asset in teaching, and also add to the diversity of her artwork. She immigrated to Canada after marrying her Canadian husband in 2010, and works in her studio on their 8 acre hobby farm in Wainfleet, Ontario.